Today marks the fourth and final week of Bacon Month 2014, folks. Some of you all may already know what I am talking about. How perfectly salty & smoky bacon pairs with sweets. Put the bacon slices in a bowl & toss them with the pepper & brown sugar. Cover a baking sheet with foil and arrange the bacon in a single layer on top. If you have any sugar leftover in the bowl, sprinkle it over top of the bacon. Top the bacon with another layer of foil and top it, squarely, with another baking sheet. The baking sheet will flatten the bacon as it cooks. Place the tray in the center of the oven and bake for 20 minutes. Check the bacon by lifting the top tray and foil carefully. If it is not golden brown and fairly crispy, cook it for 10 to 15 minutes longer. Check it again. Remove the top baking sheet and foil and transfer to the bacon to a paper towel lined plate. Allow to cool. Turn the oven up to 400 degrees. Whisk together the 1 cup flour, graham cracker crumbs, yeast, sugar and salt in a large bowl. Add the very warm water and butter. Mix until well blended, about 1 minute. Gradually add enough remaining flour to make a soft dough. Dough should form a ball and will be slightly sticky. Knead on a floured surface, adding additional flour if necessary, until smooth and elastic, about 4 minutes. Roll dough on a floured counter to 12-inch circle & then place in a greased pizza pan or baking sheet. Evenly spread the marshmallow fluff over the prepared pizza dough, leaving about an 1/2 inch diameter on the outside to form your crust. 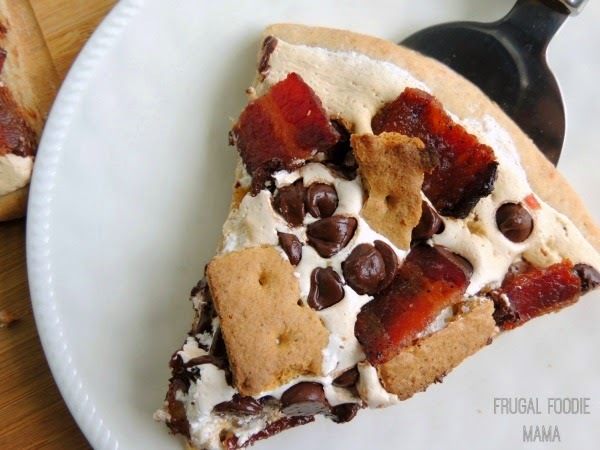 Sprinkle the chocolate chips evenly over the marshmallow cream. 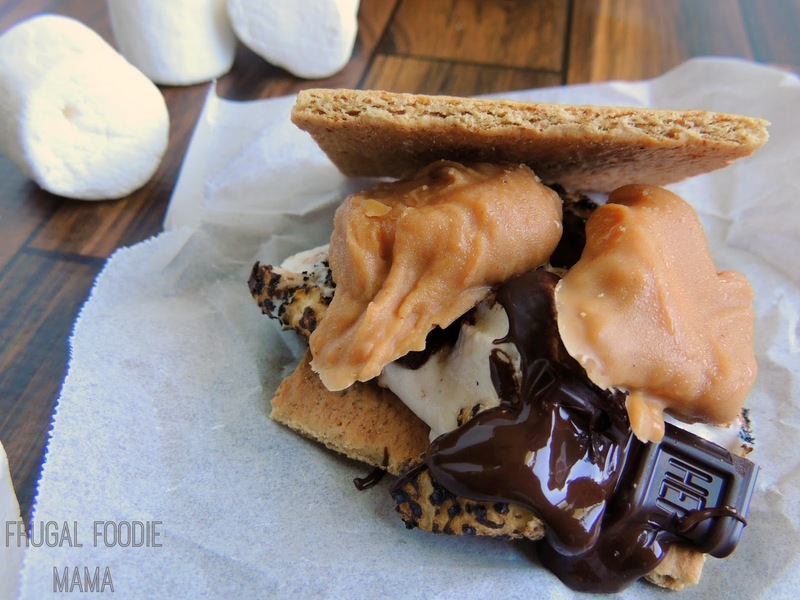 Press the graham cracker pieces into the marshmallow to fill in the empty spaces. The pizza is done when the crust & marshmallow cream are lightly golden brown. While the pizza is baking, roughly chop your candied bacon slices. 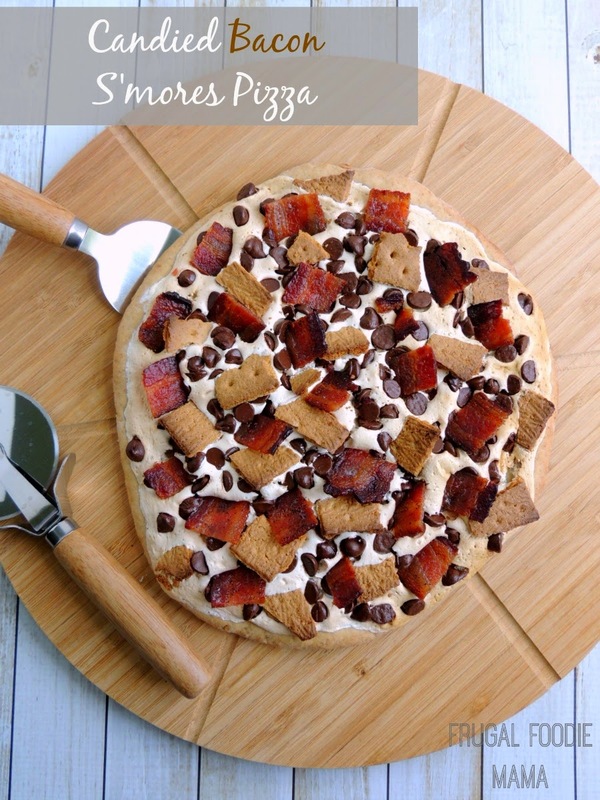 After the pizza is done baking, immediately press the candied bacon pieces evenly into the still gooey marshmallow topping. Wait at least 10 minutes before cutting. Cut into 6 even slices & serve. Candied Bacon recipe adapted from THIS ONE from Food Network. Pizza Dough recipe adapted from THIS ONE from Fleischmann's Yeast. 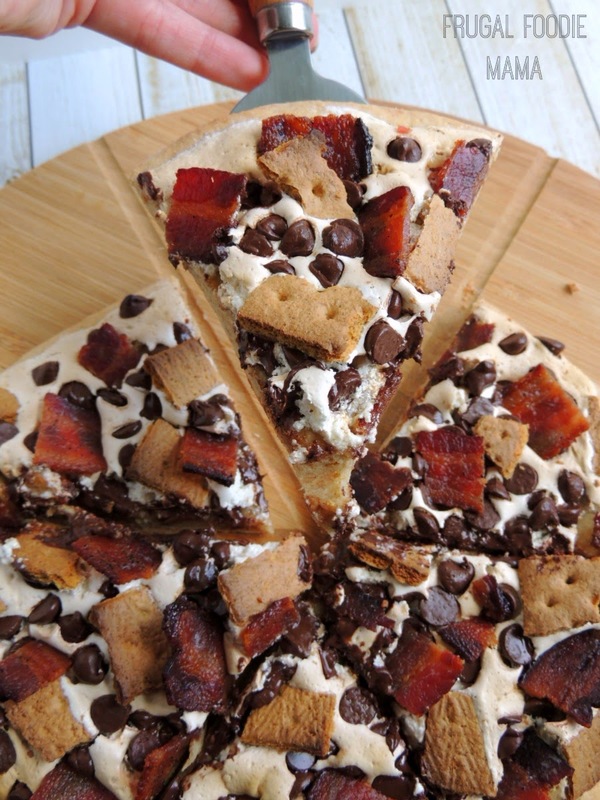 This pizza for dessert really can't be beat with it's perfectly soft graham cracker crust, gooey marshmallow & chocolate, all studded with graham cracker pieces and sweet & smoky bacon. 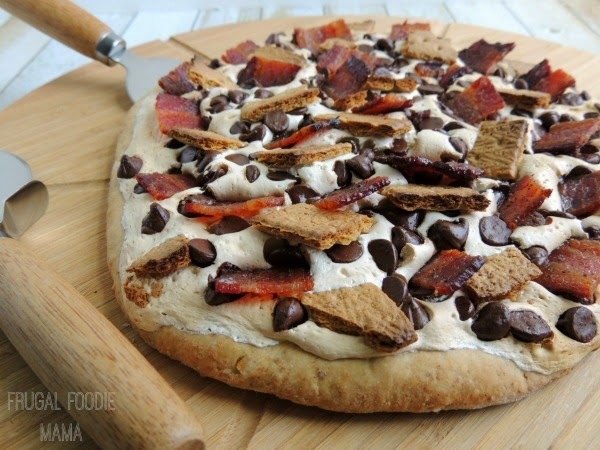 I have a feeling some of you all have been eyeing that gorgeous bamboo pizza set that I served up this Candied Bacon S'mores Pizza on. I mean, seriously. It makes me want to make a new pizza every other day of the week. And the fact that it is scored already? Awesome. 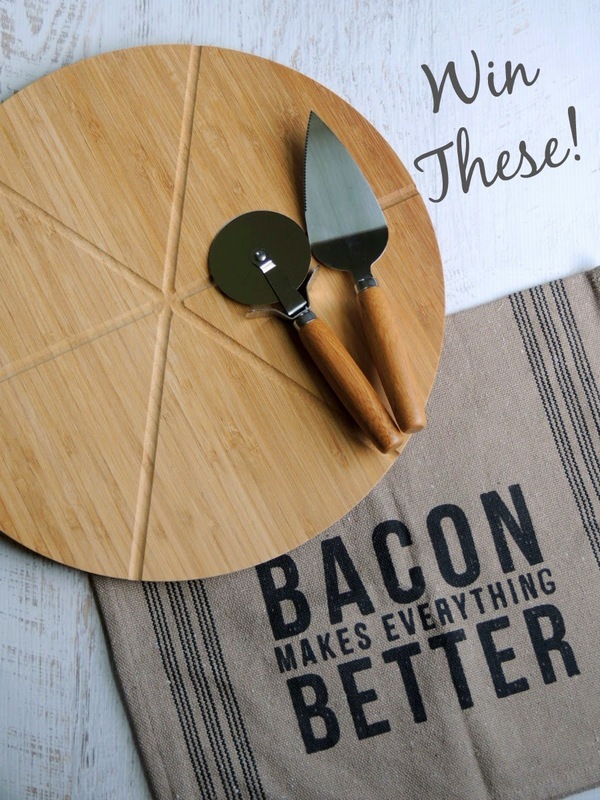 Perfectly cut & even slices every single time. Core Home provided me with a Core Bamboo Ultimate Pizza Set to enjoy and review. I was not compensated for hosting this giveaway in any other way. *This giveaway is open to U.S. residents only. All entries for the winner will be checked and verified, so please make sure you are doing what you are claiming in the Rafflecopter or all your entries will be voided. No funny business, folks. ;). By entering you give the right to use your name and likeness. Number of entries received determines the odds of winning. One winner will be selected. The winner will be notified via the email they provide, and will have 48 hours to reply to the email. If the winner does not reply back within the 48 hours, they forfeit the prize and a new winner will be chosen via Rafflecopter. The kitchen towel will be sent directly from Carrie of Frugal Foodie Mama. The pizza set will be sent directly from Core Home & Frugal Foodie Mama is not responsible for the delivery of that part of the prize. Entries must come from your MAIN social media accounts, not accounts that have been set up separately just for entering giveaways. Entries from these types of accounts will be disqualified. Protected tweets do not count as an entry method for tweeting. Tweets must come from a public account. No purchase necessary. Void where prohibited by law.